There was a time in my life when eating gluten-free was mandatory to ensure the safety of my wife. Celiac Disease and gluten sensitivity affects more people today in North America than ever before. There are several theories about why this may be happening, but I will save that subject for another day. I believe that the hybridization of wheat over the last 70 years has resulted in a grain with higher levels gluten (some have suggested that wheat today has 50 times more gluten than it did 100 years ago). Gluten is a very sticky protein and is difficult for anyone to digest properly, whether you have Celiac Disease or not. So I personally try to limit my wheat intake even though I don’t have a gluten sensitivity. 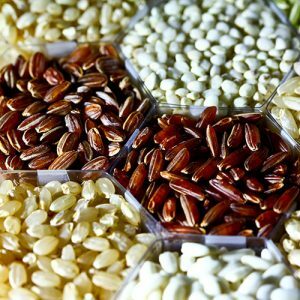 There are many excellent alternatives to wheat and I want to share my 5 favourite gluten-free grains. Don’t let this small grain fool you. It may be small, but it’s powerful. My favorite use of amaranth is to pop it like popcorn for a deliciously nutty-flavoured snack. Since it’s full of minerals, vitamins and amino acids, health experts have indicated that amaranth may help reduce cholesterol, lower blood pressure, improve immune system function and even prevent the premature greying of hair. This is a fantastic grain which has a consistency that will vary with the preparation method. It can be boiled and mashed like potatoes, or fluffed like rice. Not only does millet contain 18 different amino acids, but it also holds a significant amount of vitamins and minerals, such as magnesium, phosphorus and manganese. It has been suggested to have cardiovascular and heart protection properties, gallstone prevention traits, and offers a reduction in risk of childhood asthma. This rice is considered to be the new kid on the block. In recent years, it has been haled as a superfood by many due to it’s high nutrient values. Black rice is loaded with amino acids, fiber, vitamins and minerals. Claims have been made that black rice may help reduce blood pressure, alleviate arthritic symptoms and lower your risk of cancer, diabetes and Alzheimer’s Disease. No, not the Little Rascal pictured above. Containing over 11 amino acids in substantial amounts, as well as vitamins, minerals and even trace amounts of essential fatty acids make buckwheat a gluten-free superstar. Helping to control blood sugar and lower the risk of diabetes are just a couple benefits of buckwheat. This grain (although technically not a grain) is easy to prepare and very versatile. My favourite buckwheat dish right now is a fresh tabouli salad. My favorite grain for the last several years has been quinoa. It comes in a range of colours, including red white and black. Red is my preferred variety. This is one of the easiest grains to prepare and one of the most nutrient-dense. Quinoa has a plethora of nutritious features, such as fiber, vitamins and minerals. It could even be considered a complete protein since it contains all essential amino acids. There have been many suggested health benefits, including migraine relief, cancer risk reduction and cardiovascular protection/prevention. If you haven’t tried quinoa yet, now is a great time to start! It’s easy to see from the information above that limiting my gluten consumption is not the only reason I choose to eat these grains. Whether you have Celiac disease, a gluten sensitivity, or you’re just trying to give your health a boost, switching over to any of these grains from regular wheat or white rice could help immensely. As with all grains, the least refined the better. What are your favourite gluten-free grains and/or recipes?